My back yard borders on a creek, which usually is a tiny trickle at the bottom of a narrow, steep-walled channel, bordered by trees and grass and wild garlic. Sacramento stands on clay, which is full of nutrients for plant life, but which doesn't absorb water quickly. 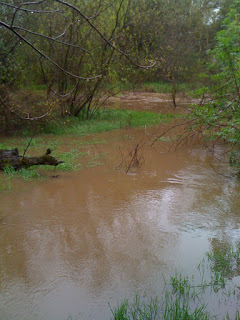 The rains of the past few weeks have proven why the creek-bed is deep, and the area around it so lush. 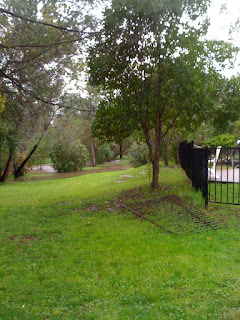 Within a few minutes of a rainstorm, the creek is full of run-off from upstream; torrential rain can cause it to overflow and it did that, impressively, last week. 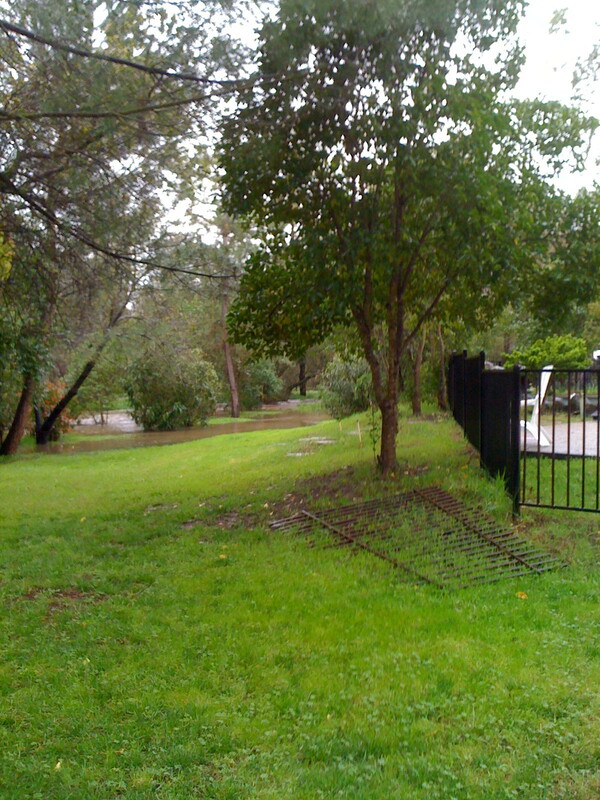 The fence on the right is around my swimming pool: the grass to the left is (usually) the back yard and public right-of-way along the edge of the creek. 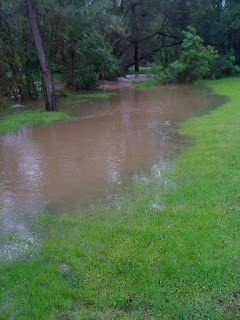 The back lawn at the height of the flood. The swirling meeting of the creek: it separates a little way upstream, splits into two, and then joins up again near my house. Dylan saw a mallard riding the waves, like a surfer or a kid on a fairground ride. The rain stops, and a couple of hours later, the creek is back inside its bed.